We have founded ourselves as a recognized manufacturer of Kidney Anatomy Model. 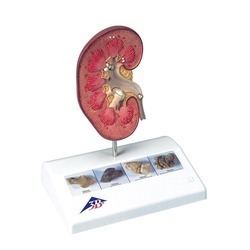 We are eminent manufacturer of Kidney Anatomy Model. We are able to manufacture and supply Kidney Anatomy Model, with the vast support of our team. We have been able to offer our clients qualitive range of Kidney Anatomy Model. strudy wooden base for easy display. • Size:30x20x24 cm & 45 parts are labeled in total. • Beautifully painted in advanced colours. Features: It also encompasses flexible as well as artificial ligaments. We have a big team who is excellent in manufacturing Kidney Anatomy Model. As a leading manufacturer and Supplier of Anatomy models, we also manufacture and Supply Kidney Anatomy Model. Our company is one of the major company who deal in Kidney Anatomy Model. Our company is able to to provide Kidney Anatomy Model to our valuable customers. We are a emerging manufacturer of Kidney Anatomy Model.